An apartment to rent in Puerto Calero, Lanzarote. It has two bedrooms and is right on the sea front overlooking the marina and ocean. 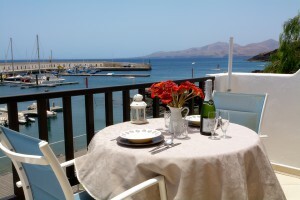 We booked an apartment in Puerto Calero, Lanzarote through Karen Durant from Holidays4u.org. The apartment was a privately owned self catering apartment. It wasn’t on a complex, so there was no pool. But the sea and marina views from the apartment more than made up for this. It was a very relaxing holiday, as the location of the apartment as very tranquil (away from the hustle and bustle of the busy Puerto de Carmen resort). I normally don’t write reviews as I run my own business, but as we enjoyed the holiday so much, I thought I would make this an exception to the rule. The apartment was clean on arrival and the furnishings were comfortable. As the apartment was very spacious and the patio doors were very large, we felt the apartment didn’t get too hot. It helps to get the sea breeze as well. We stayed in Puerto Calero earlier this month, in an apartment with sea views. The apartment was very close to all the facilities of the resort such as restaurants, bars and boutiques as we were very close to the marina. The apartment was a privately owned self catering apartment, which is very well maintained by the owner and the local management team. We will definitely consider returning next time we come to Lanzarote. Puerto Calero is a very relaxing resort. We booked an apartment which was very close to all the amenities. It was nice to be able to stroll out to a restaurant in the evening. We were close to the marina, so we were able to book an excursion on catamaran to watch the dolphins. An apartment to rent in Puerto del Carmen with sea view. It is located right on the front line overlooking the old harbour in the Old Town area. We booked a one bedroom apartment in Puerto del Carmen through Karen Durant from Holidays4u. It was for our wedding anniversary. On arrival we were very pleased as the apartment was spotlessly clean. We found everything we could possibly need during our holiday, starting with the wine opener (I normally pack one just in case!). There was even a sandwich maker. The owner clearly uses the apartment a lot as sometimes facilities can be more basic. We had a very good sea view from our apartment window, which was the reason for booking this apartment. There was no air conditioning but it wasn’t really necessary in February. 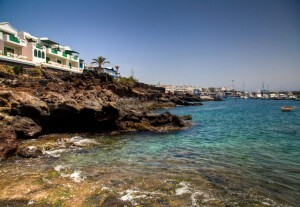 We love the area, especially around the Old Town of Puerto del Carmen. We visited some nice restaurants and bars. Perhaps it would be unfair to mention one in particular. The apartment was very comfortable both the seating in the lounge and the beds in the bedroom. The owner has also left a welcome pack in the apartment for our arrival, which included a bottle of fizz, as well as water, tea, coffee, bread, milk, fruit juice etc. It was indeed very welcome as we arrived on a late flight and were quite tired. The last thing we wanted to do was go out shopping. We weren’t even sure if any shops would have been open at that time of night. Instead we relaxed on the balcony with a glass of bubbly. Very nice! A two bedroom apartment with sea and marina views in the Old Town area of Puerto del Carmen in Lanzarote. The apartment has satellite TV. These apartments in Puerto del Carmen with sea views are in an excellent location, as they are on the cliff top in the Old Town area with views over the marina. Some stairs have been built into the rocks to allow easy access to the sea, where you can swim in the clear waters. The apartment has two bedrooms, one with double bed and one twin room. The lounge is comfortably furnished and has satellite TV. There is a terrace with patio furniture. Please note there is no pool. There are a few steps to access the apartment and also a few steps down to the road. 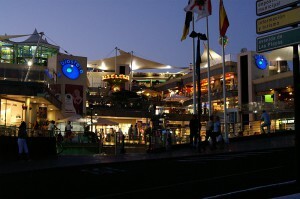 The largest shopping centre in Lanzarote, situated in Puerto del Carmen. 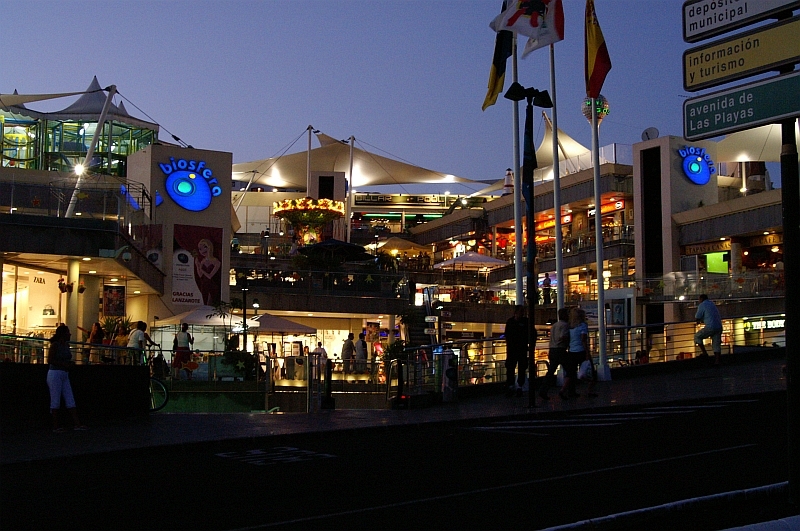 The Biosfera Plaza Shopping Centre is the largest shopping centre in Lanzarote, around 25,000 square metres. 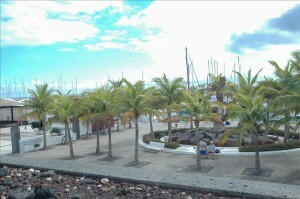 It is situated on Juan Carlos I Street in the Old Town area of Puerto del Carmen. It is a modern building, laid out over 5 levels. Opened in 2002 the centre consists of a wide selection of shops, bars, restaurants, an amusement park for children and mini golf. There are lifts to all floors and a car park. Some of the shops include Zara for adults and children, Vodafone, Levis, Timberland, Movistar, Haagen Daas and Mango.